The Glove Hating Gardener’s Soap with a newly designed art gift bag! The holidays are over and seed catalogs are arriving with bucolic photos of life in the garden. Winter is a time of planning for future growth for the gardener or farmer. The same is true for this soap maker. Both farmer and soapmaker make decisions and spend money based on faith in skill and environment. Little income comes in during the winter season, but lots of money goes out . . . all with belief in future harvest. I spend most of my Saturdays year-round vending with farmers along with bakers and crafters. Like the farmer, my life has its season. This winter season I am in the process of updating the website with new photos and descriptions. I need to write a blog on felting soap. The final finish of 2016 book-keeping and inventory must be completed. And what I’m most excited about is the development of my version of little net sacks that create more suds for soap. 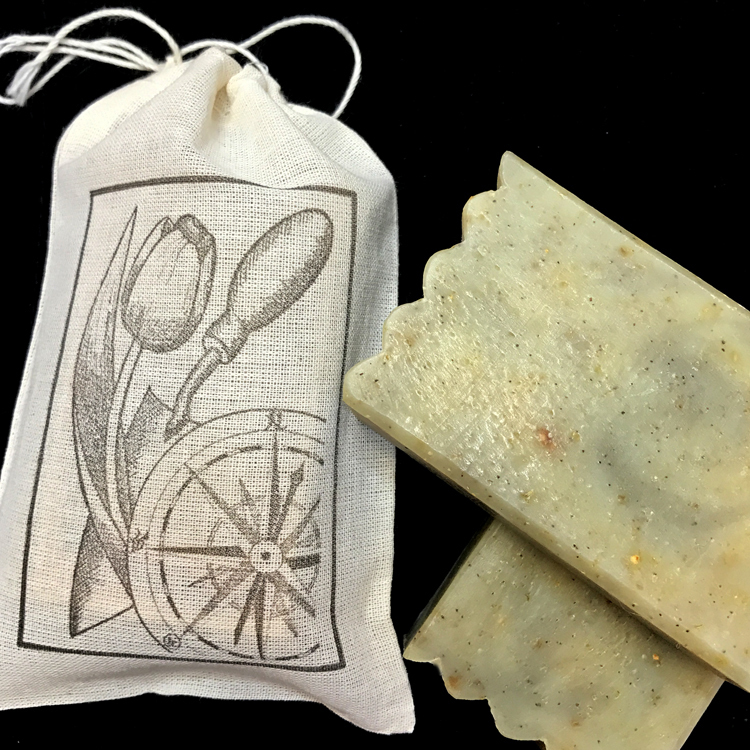 One of the updates to the website is the addition of the latest design created by Lynda Chandler for my soap company’s gift bags. It is finally up on the website for purchase! Hope you love it as much as I do – I call the design, “the directional gardener”. The gift bag project continues this year and hopefully several more designs will be added. A sewing machine for the suds-making-sack-project along with a new cell phone for better photos has been added to my soap company’s equipment. Just like seeds or farming equipment, my new tools are a must for growth. Like all gardeners and farmers, I’m always looking out for the heirlooms and creating new varieties. Mine are just soapy and go up in bubbles! ← What is Hot for the Holidays in Handcrafted Soap? I love your post, Lori! Thanks for the great introduction! Thanks Lynda! I’m looking forward to more of your designs! It is a frequent comment when people talk about gardening!